Obama Libya Speech: Striking For What Was Unsaid As Much As Said : It's All Politics President Obama's Libya speech was striking as much for what he didn't say as for what he did. For instance, he didn't try to put his actions in Libya in the long context or mainstream of U.S. foreign or military policy of other presidents. 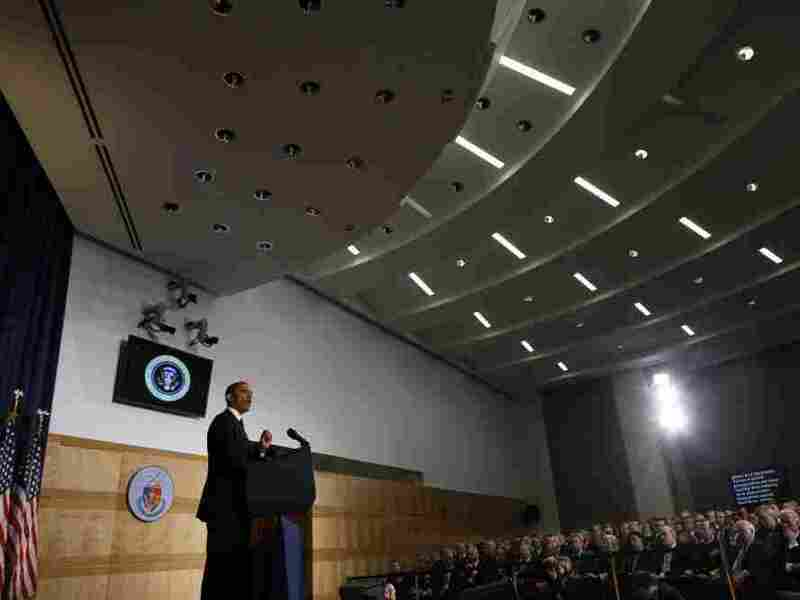 President Obama defends his Libya policy at the National Defense University, Washington, DC, Monday, March 28, 2011. President Obama's Monday night speech on Libya was probably as striking for what he didn't say as much as what he did say. For instance, he didn't offer details for how much longer the U.S. military will be actively involved in the effort. It's not hard to see why he'd avoid that one. No one knows at this point how long it will take for Moammar Gadhafi to fall, if he indeed does.Weeks, months, more, who knows? And with the military option being handed off to NATO that means the U.S. essentially handed the operation back to itself since it is the first among equals in the U.S.-European military alliance. He didn't promise to keep Congress or the American people informed with future updates. Everyone knows the president and his aides would clearly rather be talking about the economy than the confused Libyan conflict. Gadhafi has already distracted from their domestic agenda any more than they've wanted. He didn't appeal to history, the actions of past presidents, to make the case that his decisions were in the long tradition of U.S. foreign or military policy. Of course, the track record of U.S. armed humanitarian interventions is uneven. True, Bosnia and Kosovo went relatively well for the U.S. Somalia, on the other hand, with its "Blackhawk Down" debacle, was viewed as a disaster. Placing his decisions in the context of what other presidents have done might have also helped him beat back accusations that he had exceeded his constitutional authority by ordering the military to act without more congressional input. But clearly, the president didn't feel compelled to do that. For those reasons and more, the speech is unlikely to satisfy many of Obama's critics, some of whom wouldn't have been mollified even if he had accepted wholesale their suggestions for what to include. What the president did say that may become the most analyzed part of his speech is how he will approach the use of military force during his presidency. Like virtually all his predecessors, he stated unequivocally that he would use the military unilaterally if it was necessary to defend the nation from a threat. But during his presidency the U.S. will act militarily not just when its security or vital national interests are at risk but also when its "interests and values" are threatened, Obama said. But in these cases, for instance to stop genocide, the U.S. won't act alone but with international partners to help rovide military personnel and money for such efforts. Obama was putting the world on notice that protecting innocent civilian populations or the democratic aspirations of a people weren't just the work of the American people but of other nations that share its values. But Obama made sure to state that even when it was part of such an international effort, the U.S. would still pick its shots. That's because not every dire situation in the world can be made better through the limited means he was willing to use. It was Obama's way of saying in such instances, Americans shouldn't let the perfect be the enemy of the good. On the other hand, he had a message for the hawks who want U.S. troops to kick in Gadhafi's door or give the dictator the opportunity to die for his country. That would come at too high a costs of American blood and treasure, Obama said. It was one of those moments that was a reminder that in the Obama presidency is a reaction to that of his immediate predecessor, George W. Bush. Of course, there is no question that Libya – and the world – will be better off with Gadhafi out of power. I, along with many other world leaders, have embraced that goal, and will actively pursue it through non-military means. But broadening our military mission to include regime change would be a mistake.